The fresh big list of wireless adapters with 100% Kali Linux support here. For a while TP-LINK TL-WN722N is one of the most popular Wi-Fi adapters that works well in wireless attacks with Kali Linux. Many owners recommend the dongle. 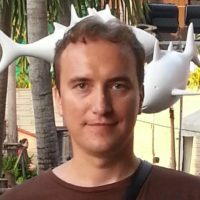 Some time ago, TP-LINK TL-WN722N V2 came out, i.e. the second version. It has other chipset. At the time of writing, it was not possible to set it to monitor mode. Now for the good news. 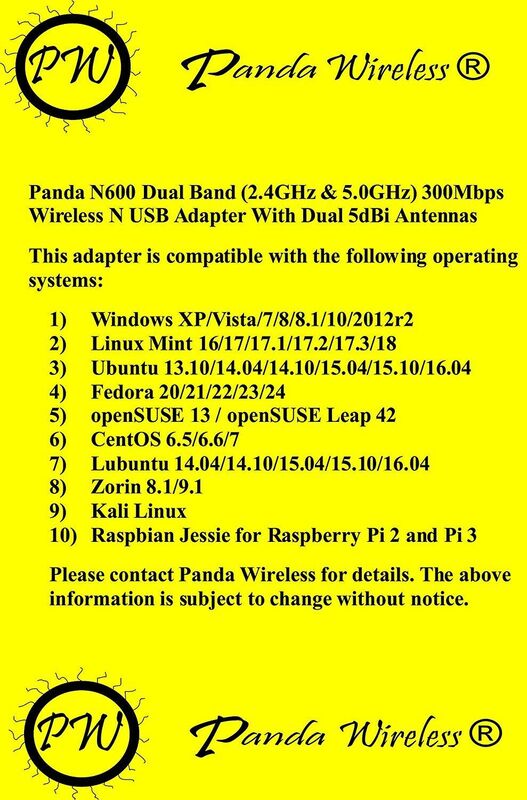 A new wireless USB adapter named Panda PAU09 is compatible with Kali Linux. It supports monitor mode and injections. 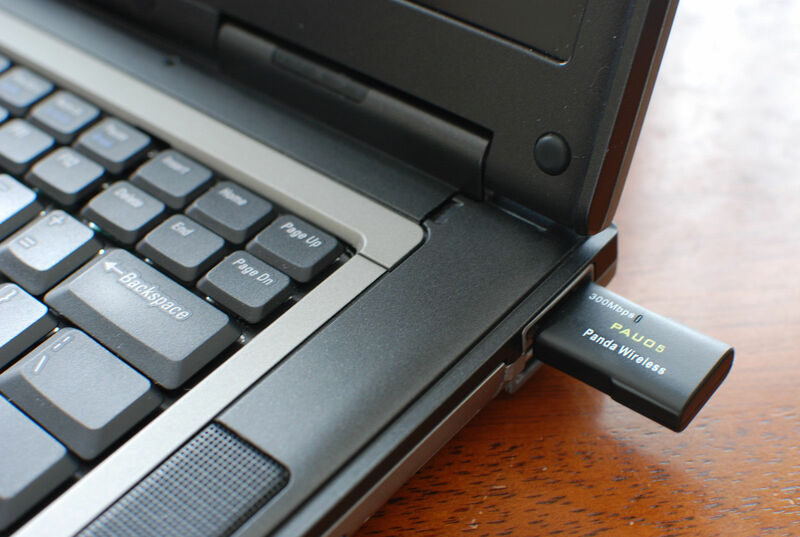 The adapter supports several Linux distributions, as well as Windows. 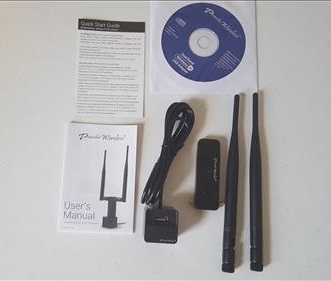 The wireless dongle has two large 5dBi antennas to improve the signal. The package comes with the dongle, two 5dBi antennas, driver disk, instructions, and a USB extender stand. The antennas use a standard SMA connector and simply screw on to the dongle. Panda PAU09 is compatible with most any version of Windows including XP/Vista/7/8/8.1/10/2012r2 32-bit and 64-bit. The chipset and the driver of this adapter supports monitor mode. 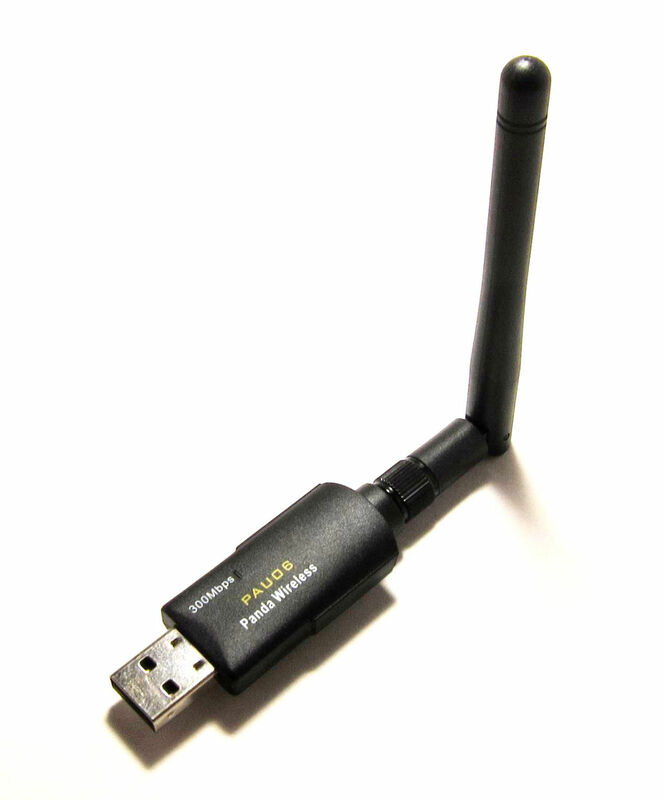 Another modern adapter that is fully compatible with Kali Linux is Alfa AWUS052NH . It also has two detachable antennas. It has a USB extension cable, but cannot, unlike the previous one, to be plugged into the computer directly. Panda Wireless PAU09 N600 compared with this model can be considered as a more compact option. Though it is rather conditional – with such antennas PAU09 is still quite large. Before that time I did many of my wireless pentests with Alfa AWUS052NH. More details about its merits and demerits, I wrote here. This Panda PAU06 USB Wi-Fi can be considered a younger model of the first Panda PAU09 . It supports standard 802.11 n, but there is no support for 5GHz. It got the only one antenna. It can be set to monitor mode. Wireless adapter Panda PAU05 USB Wi-Fi is an even younger model. It also can work with the 802.11 n standard, but there is no external antenna at all. Do not think that the younger model means a worse model. Sometimes it is important not to attract attention - for that situation it is ideal. Also it supports monitor mode. 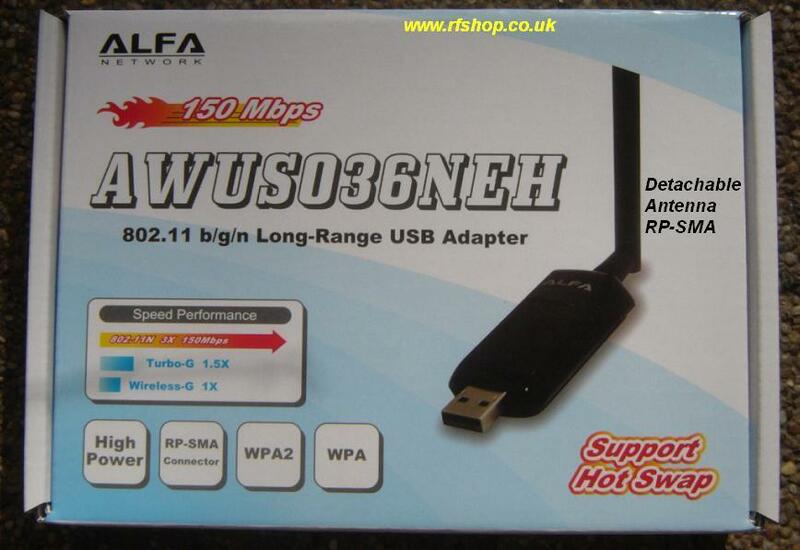 Alfa AWUS036NHA adapter is a well-established model. 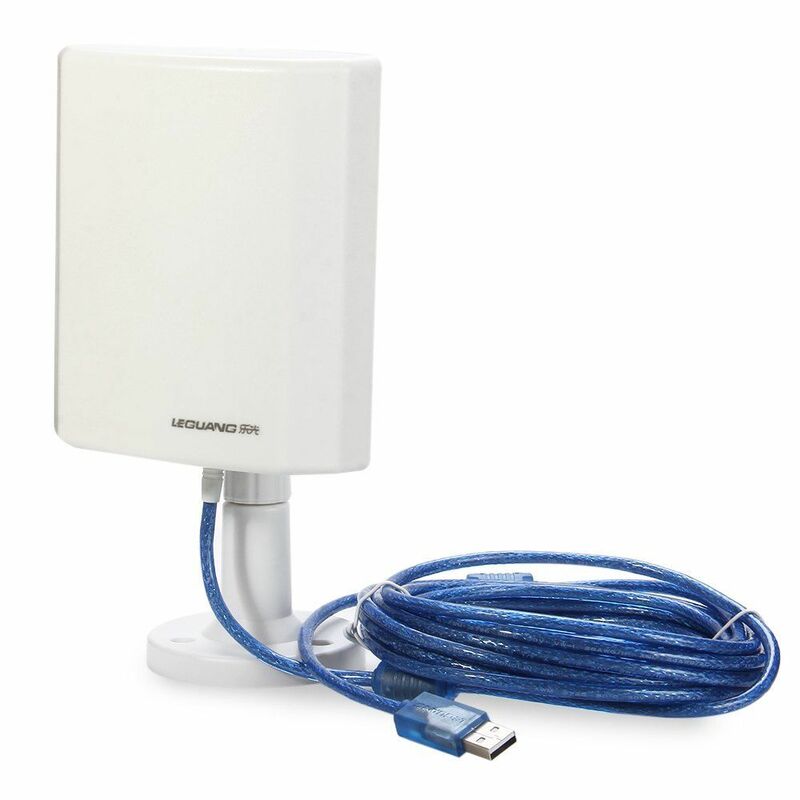 It supports 802.11 B / G / N, has a 5dBi antenna and a mounting clip. Its feature is the Atheros AR9271 chipset, thanks to which it breaks WPS easily without any tricks in contrast to Ralink chipset. 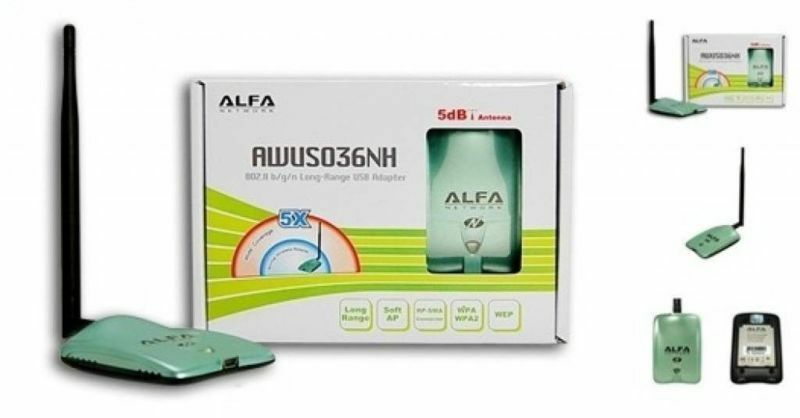 Alfa AWUS036NH is another proven and reliable model. It has similar specifications and appearance to the previous card, but it got other chipset. It features Ralink 3070, a good chipset that can be set to monitor mode and perform wireless injections. But there is a problem with Bruteforce WPS PIN attacks and new Linux Kernels. 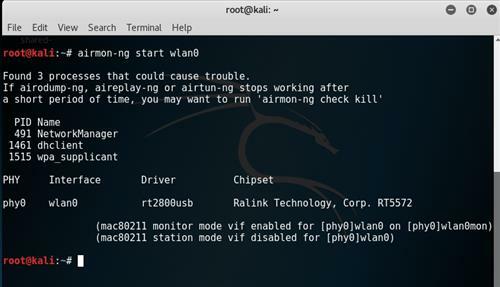 Nevertheless you can start Bruteforce WPS PIN attacks even with Ralink chipsets, click here for details. 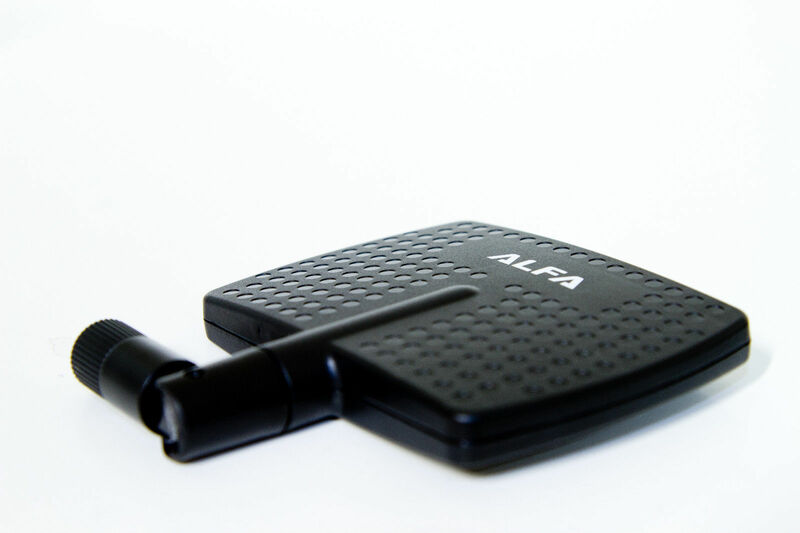 The Alfa AWUS036NEH card features a more compact form factor. 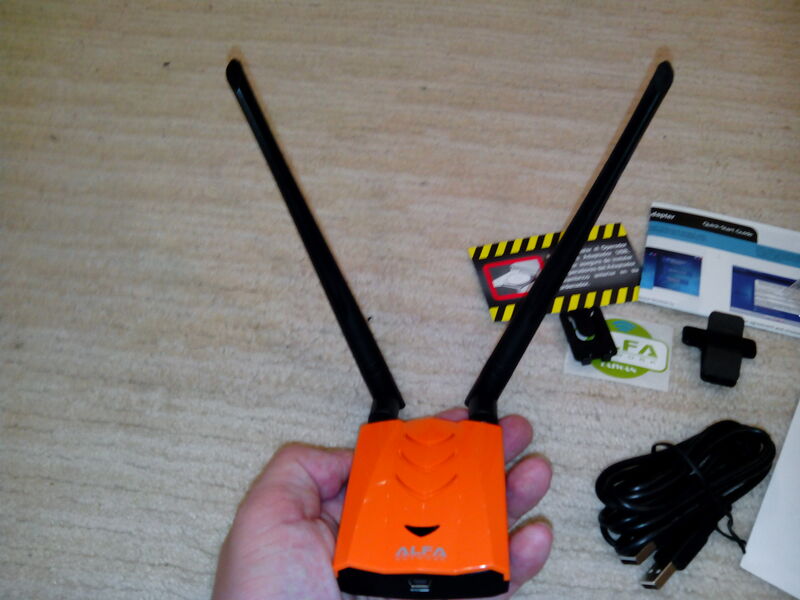 Nevertheless, it has a 5dBi antenna and it also works on the Ralink 3070 chipset. LEGUANG LG-N100 wireless adapter supports 802.11 n standard. It is based on the Ralink RT3070 chipset. According to reviews, it supports monitor mode and works with Kali Linux fine. 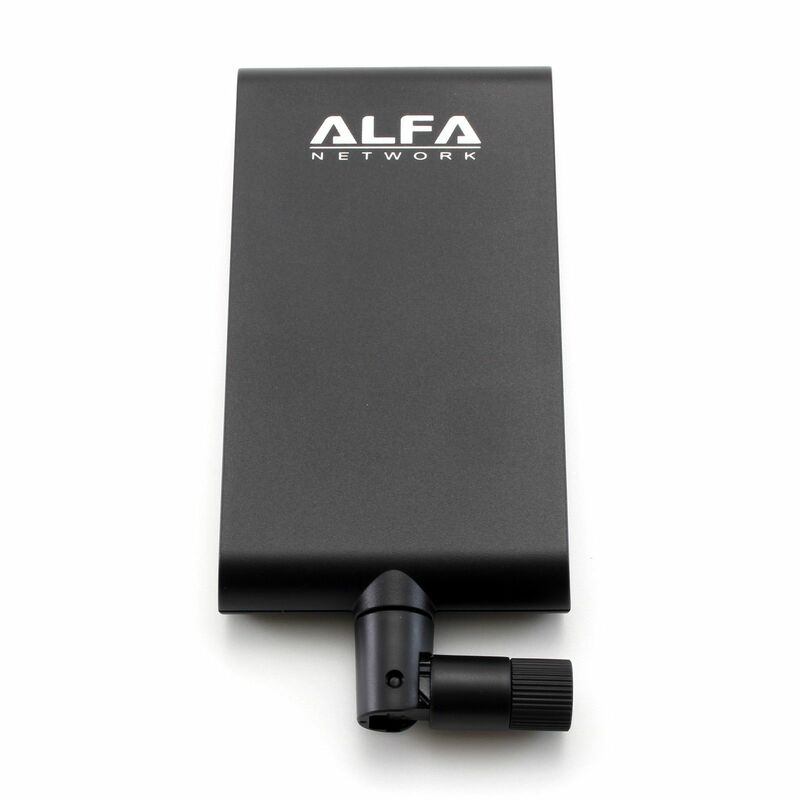 Alfa ARS-N19 is an active omnidirectional antenna with a gain of 9dbi. You can buy a white version or a black version (differ only in color). It operates only on 2.4Ghz. 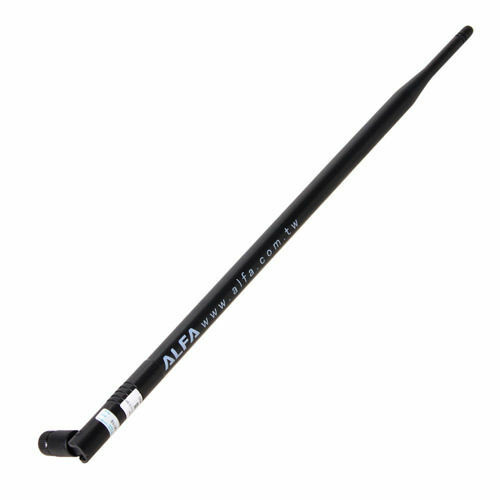 APA-M04 is a directional antenna with a gain of 7dBi. Like the previous one, it operates only on 2.4Ghz. 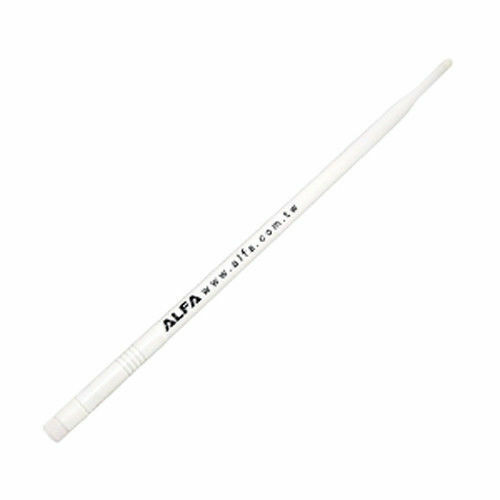 Alfa APA-M25 is a directional dual-band antenna. It operates at frequencies of 2.4GHz + 5GHz and amplifies by 10dBi. Once again, if missed above, the working surface of the directional antennas is the one on which the word ‘ALFA’ is written. 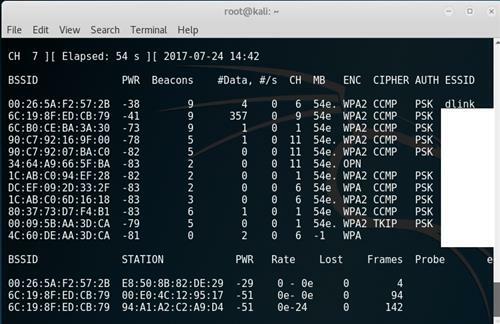 If there are problems with WPS attacks or with handshake captures, then you should try to move the wireless card: the signal may be different in different parts of the room and sometimes it's this unobtrusive difference that determines whether the attack will succeed or not. The general rule: the longer the cable, then the weaker the signal and the more this signal is subject to interference. Therefore, you need to choose only quality cables, otherwise you will only make it worse. 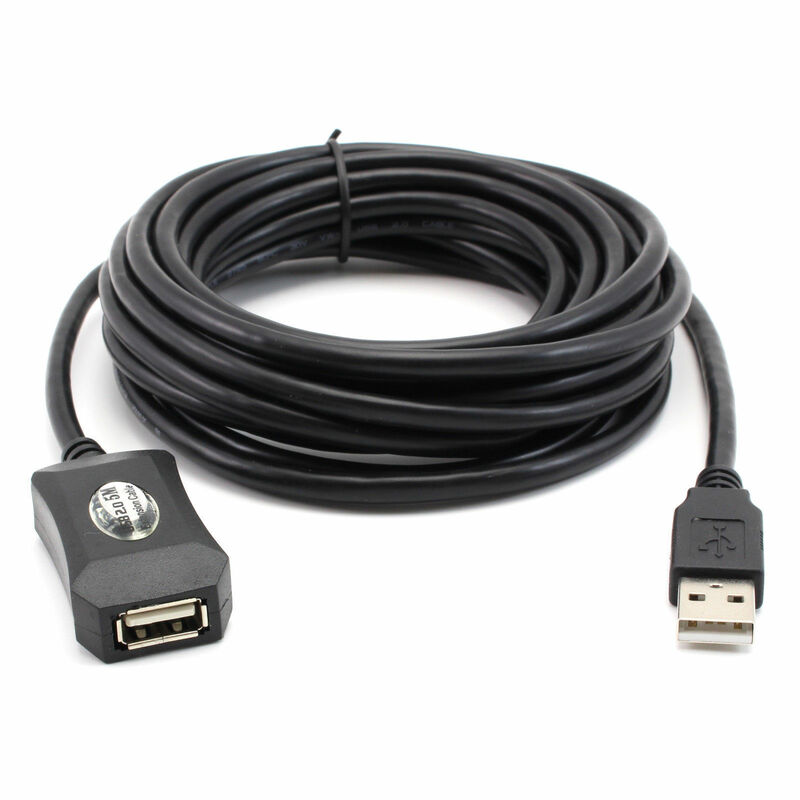 AUSBC-5M is an active 5-meter USB extension cable manufactured by Alfa. It is very high-quality. It has longer models, but I think 5 meters is enough for most of us. In addition, for too long variants, the chance of negative influences in the form of signal weakening and the appearance of interference increases. If you use a Wi-Fi card with a detachable antenna, then you can use the magnetic antenna base. 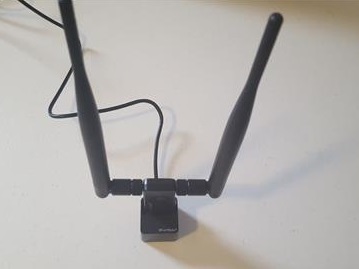 They work in the following way: the antenna is removed from the Wi-Fi card, the magnetic base cable is connected to this ARS-AS01 connector, and the antenna (from the wireless card or more powerful) is screwed onto the magnetic base. As a result, there is additional mobility. 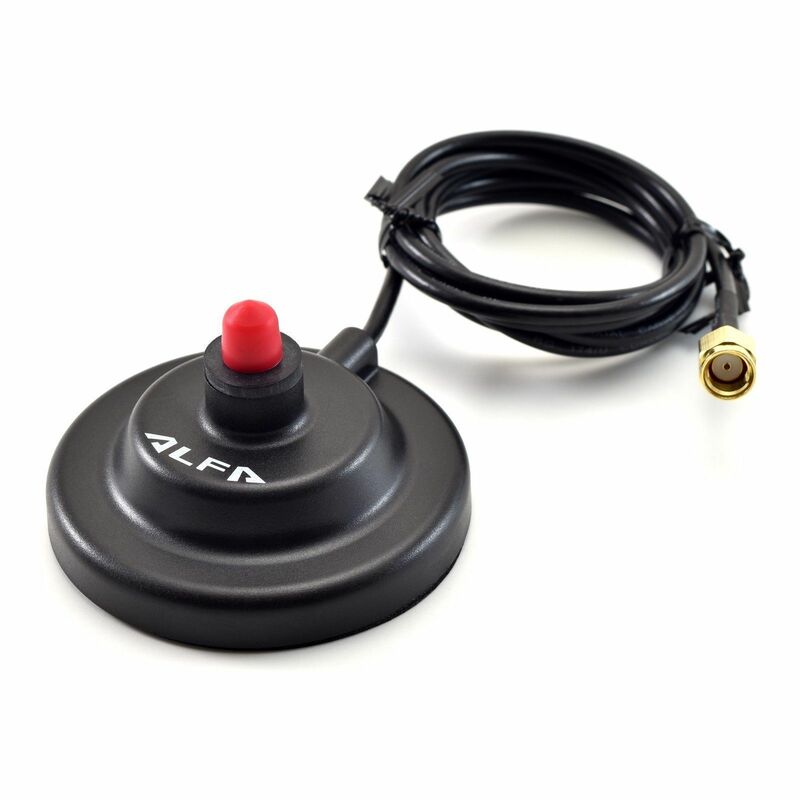 Alfa Magnetic Base ARS-AS01 is a Magnetic Base extension for RP-SMA Antenna, it is compatible with all cards with detachable antennas, it has a cable 1 meter long. If you want to be "fully armed", i.e. you need 5GHz support (maybe not even for attacks, but for tracking Wi-Fi networks), then I would recommend Panda Wireless PAU09 N600 or Alfa AWUS052NH . If there is no urgent need for 5GHz support, I would recommend something from Alfa AWUS036NH (according to my observations, the most popular adapter among pentesters) or Alfa AWUS036NHA (it should have fewer problems with WPS attacks). Hello! Panda Wireless PAU09 N600 can be considered as outdated now. Please look at the new list here. For the same price you can buy Dual Band adapter with ac support. It is reported, that rtl8812au driver supports monitor mode and wireless injection now. 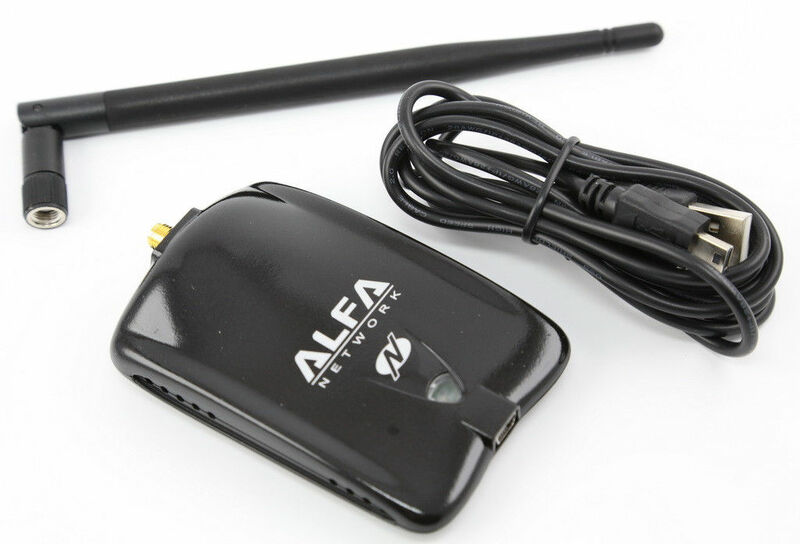 I am intending to buy an ALFA AWUS036NHR v1, but not sure if it supports monitor mode and wireless injection.